The Talia is a classic pastel pink profusion of stems that is sure to impress the more mature woman in your life. 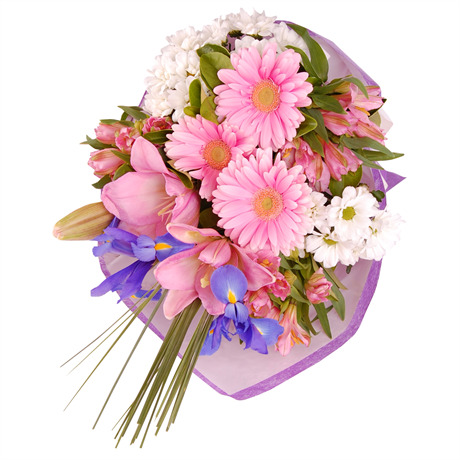 This is the soft, feminine answer to our Leah bouquet, and features fluffy white chrysanthemums, pastel pink gerberas, silky blush lilies and delicate violet irises. This gorgeous bouquet is a throwback to English cottage gardens and high teas. Creatively arranged in a bouquet and hand-tied with paper and silken ribbon, this traditional pastel creation is guaranteed to impress the lucky person who receives it. This stunning bouquet does not come in a vase, however we recommend selecting a regular vase from our gift section. Vases act as keepsakes, and are also convenient for your recipient.